Neck discomfort is the most widespread symptom disclosed after an car wreck, and it's not hard to see why. During a collision, your body moves with the car seat while your head lags behind due to inertia. It is this difference in motion that leads to injury. Your spinal column is susceptible to sprain and stress from shear forces that result from the head and body shifting in different directions. This shearing motion can stretch or tear the ligaments and disks of your spinal column, resulting in pain, inflammation and scar tissue. Research has established that up to 1 out of 5 people can have neck pain symptoms even 10 years after the collision. If you have been injured in a wreck, Dr. Slater might be able to help. Research shows that chiropractic can help improve neck range of motion and prevent scar tissue from forming after an injury. And other studies show that early treatment can also help preclude the development of persistent pain. 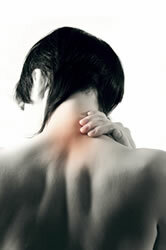 If you have been in a crash and have symptoms of neck pain, Dr. Slater is here to help. We can help identify the root source of your problem and formulate a plan of action to help you reclaim your health. We've helped many patients in St Paul MN improve from these sorts of problems. Call our office today at (651) 699-3366 for an appointment or for more information.